Nepal was struck by a 7.8-magnitude earthquake on 25 April — a disaster that killed thousands of people. Many more were injured or displaced, including countless children. PhD fellow Vincenzo Vinci, who works for UNICEF Nepal, sent this update as part of a Q&A with GPAC² Director Dr. Mindel van de Laar. UNICEF’s first priority is to protect children. Has the recent disaster changed the needs of children in Nepal? How has UNICEF responded? VV: Obviously the recent earthquake has changed the response UNICEF is providing. UNICEF is supporting the Nepalese Government, in coordination with other UN agencies and partners, to meet the immediate needs of the affected population including women and children — who represent more than half of the affected population. The interventions aim to ensure access to basic health services, water and sanitation. UNICEF is also providing psychosocial support for children, to re-establish normal lives for those affected by events. With many schools lost in the devastating 25 April earthquake, UNICEF is putting its effort into making sure children get back to school and to their routine. The strategies adopted to respond to the immediate needs of the population also present an opportunity to build back better and to transition back to the relief and regular operations. Your PhD examines the relationship between institutional quality and social protection expenditures. Nepal is one of your planned case studies. Will that change now? VV: Currently I am working with the econometric part of the research, which involves cross-sectional and panel data analysis of various countries around the world. The case study of Nepal is something I will start working on at the end of the year; before starting the analysis I will need to objectively assess the possible changes in the assumptions and context previously made or how they have changed due to recent events. This is something that, although at first sight appears a challenge, may in fact bring opportunities that were not anticipated. It is good to have a support team in Maastricht where these and other issues can be discussed and weighed as I move forward with the implementation of my research project. Last year you moved to Nepal, along with your family, to work for UNICEF. What does your everyday work cover and focus on in particular? VV: In 2014, my family moved to Nepal and during this time I started working with the UNICEF Regional Office for South Asia as a Social Policy and Programme Planning Specialist. In this capacity I have been providing support to internal regional programme planning and technical support to eight UNICEF country offices in the South Asia region, including Nepal. You work across eight countries, as well as having a family to take care of. How do you manage all of this alongside your PhD? VV: The decision to pursue a PhD programme is something which requires passion, determination, and constant application. In all of this, the support and understanding of my family is essential to the overall success of the PhD, and in ensuring that I don’t compromise my personal life from my professional aspirations. 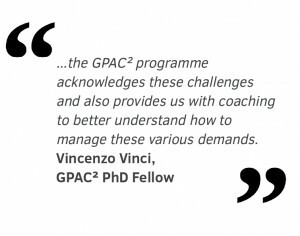 In addition, the GPAC² programme acknowledges these challenges and also provides us with coaching to better understand how to manage these various demands.